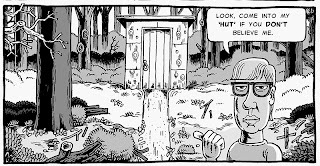 My Friend Dahmer opens with a very powerful, and unsettling, scene in Dahmer's clubhouse in the woods. This particular episode was recounted many times in the media. The clubhouse, which Jeff always called "The Hut" was where he kept his road kill collection. The carcasses were stored in pickle jars full of some kind of liquid (he bragged that it was acid, but more likely it was either some household chemical or plain water). By the time he was 12, there were several dozen of these jars, neatly arranged on wooden shelves that covered the inside walls of The Hut. It was the first manifestation of the dark thoughts and urges that were gurgling in the crankcase oil of his brain. I initially heard of this episode (and I won't give it away here) when I first met Jeff in junior high. It was part of Dahmer's schoolyard legend. Eastview Junior High was where the contents of the district's three elementary schools came together for the first time. So roughly 70 percent of the kids were complete strangers. The result was a cruel hormonal scrum as kids elbowed and clawed their way to their spot in the social hierarchy. There was a lot of gossip, and the Bath Elementary kids, who had known Dahmer since 3rd grade, all had tales of how weird he was. 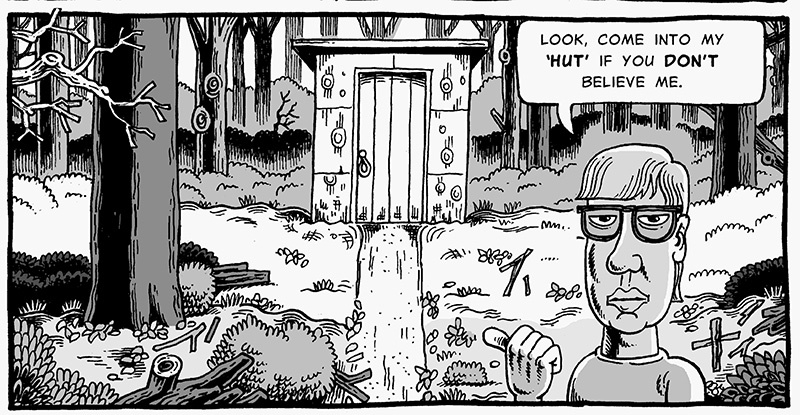 Soon, the tale of Jeff's clubhouse and his jars of roadkill were known to all. It was an episode that cemented his rep as a bizarre freak and sent him straight to the bottom of the social ladder. When I wrote this book, there was no doubt I would start with this scene. It fit perfectly in the timeline, the summer before the start of junior high, and it's a very visual scene that afforded me the chance to make a big artistic statement right from the get go. This scene had been recounted before in newspaper and magazine accounts. It was not something that I uncovered during my research. But, in those articles, It was always just a short paragraph, and never captured the true creepiness of what went on there. This is, of course, the power of comix. I could recreate this scene in a way that a reporter could not. Now when the story exploded in 1992 and there was a mad scramble to cover it, I was working as a staff artist at the Akron Beacon Journal. Bath, our hometown, was a rural suburb of Akron, so the Beacon was the paper of record. At the time, it was a very fine paper, one that won a Pulitzer every five years or so. It was well-positioned to "own" this story, and indeed did just that. And, of course, by sheer dumb luck I was on staff, with all my knowledge and contacts and memories, and worked hand in hand with the reporters covering the unfolding story. The clubhouse episode was first reported there, based on my information, and then was quickly picked up by media worldwide, who just lifted it from the Beacon article, or re-reported it on their own. When the reporter on the police beat first went to Dahmer's House, using his contacts to get through the police tape that ringed the property and get a private tour, I told him to be on the lookout for Jeff's clubhouse. He found it. The above photo is all of it that remained in 1992, 20 years after the scene in my book took place. A pile of rotten rubble, strangely mirroring Jeff's own life. Most kids in the country had a similar clubhouse. I had one. 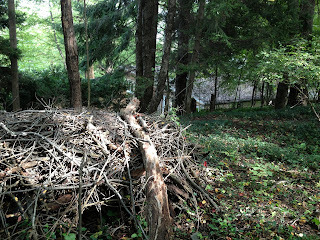 I used to build my own in the woods around my house from pilfered scrap lumber. My dad would find them eventually, proclaim them "eyesores" and tear them down, giving me and my brother a tongue lashing in the process. Finally he had my grandfather, a carpenter, build us one. It still stands, as a storage shed for lawn equipment. Jeff's dad built his clubhouse, around 1970. What did it look like? Well, I had only a few clues. I guessed it was probably constructed like my clubhouse, from 2x4s and plywood. Popular magazines like Boy's Life regularly printed plans for constructing such structures. In fact, the interior in the book IS my clubhouse. I made sketches there for this scene. I didn't have much to go on from the picture of the ruin itself, except that it had a flat roof, which you can see in the photo. Mine had a pitched roof. 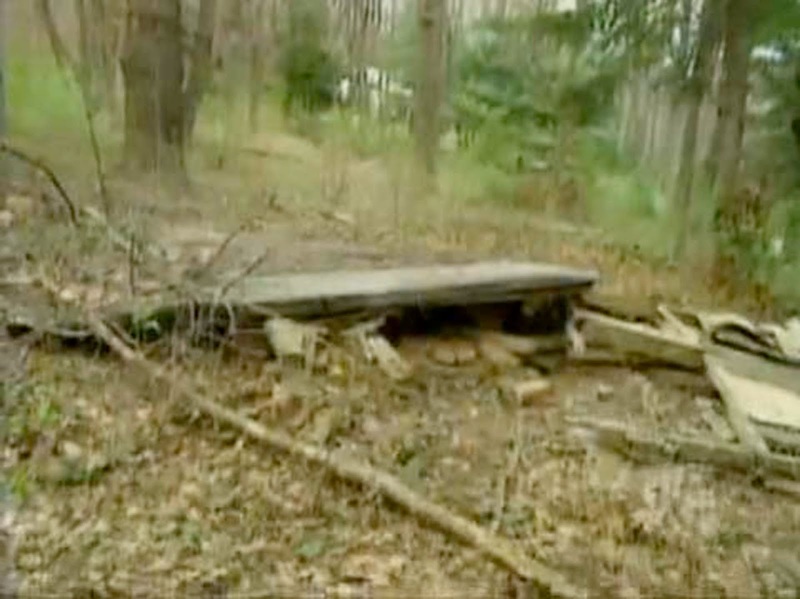 I also wasn't sure where its exact location was on the Dahmer property. By the time I started working on the book in earnest and had access to the house and property, this pile of rubble was no where to be seen. So I guessed, based on a visual survey of the lot. Where would I build a clubhouse? Mea culpa: I guessed wrong. The Dahmer property is one of the most dramatic, and unusual, in town. 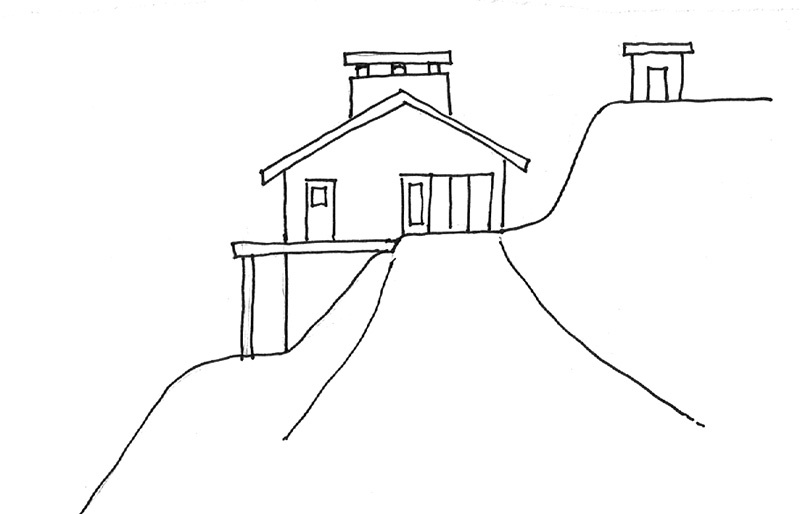 The house is shoehorned onto a very steep hill. The above side view shows it. This is looking down the driveway. I've removed the stand-alone garage here, which sits in front and blocks out half the house. The hillside is dotted with huge boulders, remnants of the Ice Age glaciers. At the bottom of the heavily wooded hill is a large pond, more an algae-ridden mire. I thought the clubhouse must be down that hill somewhere, and that's where I drew it. 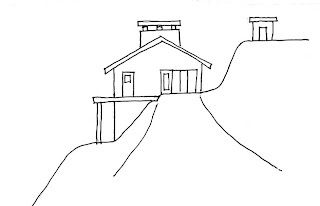 In fact, it was at the top of hill above the house, as I picture here in the diagram, where the terrain flattens out! The view from Jeff's clubhouse. I discovered this just last year, after the book had been released. I had arranged with the guy who lives there to give my filmmaker a tour. The tenant, as you can imagine, was also interested in my account. It's a damn strange place to live! I had asked him before about the clubhouse, but he didn't know where it was. As I was describing what remained of it in 1992, he blurted out "Waitaminute! I know where that is!" Turns out all that remained was the plywood roof, covered in asphalt shingles. All the other rotting rubble had been cleared away by the previous owner. The current resident used that roof to pile brush. He took us right to the spot. We pulled back the brush and there it was. As always, a very creepy discovery. 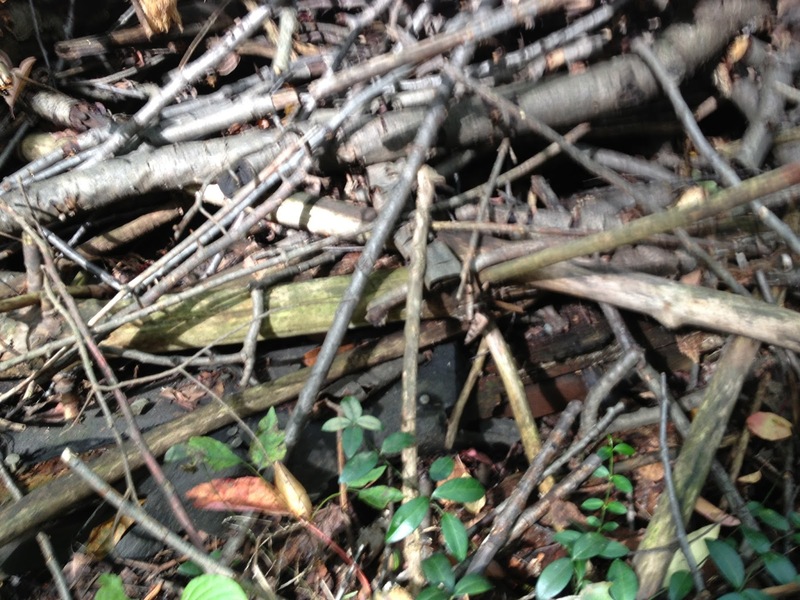 You can just make out the roof under the brush pile. But a frustrating one. It would have been much more visually dynamic to have drawn the clubhouse in its correct spot. From this ridge, a kid could actually jump onto the Dahmer's roof! It was another example of Jeff's bizarre endeavors taking place, in this case, right on top of the family home. To be fair, when Lionel Dahmer got wind of this incident, he grilled Jeff about his strange hobby, and the scientific value of it, of which Lionel could see none, despite Jeff's insistence that scientific curiosity was his sole motivation. Jeff then disposed of his roadkill collection and abandoned his clubhouse. Lionel thought that was the end of it. Far from it. 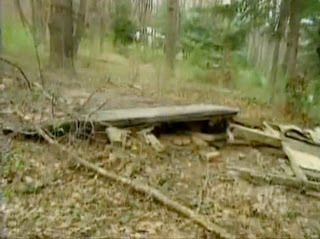 Jeff established a new, secret spot, deep in the vast, thick woods across the street, where he took his roadkill finds. He didn't store them in jars anymore. He dissected them and fondled the organs and became sexually aroused. And took another big step toward the edge of the abyss. In my defense, when I asked one of the neighborhood kids who participated in the scene, if I had gotten it right, despite the wrong location, he said "Yeah. You pretty much nailed it."